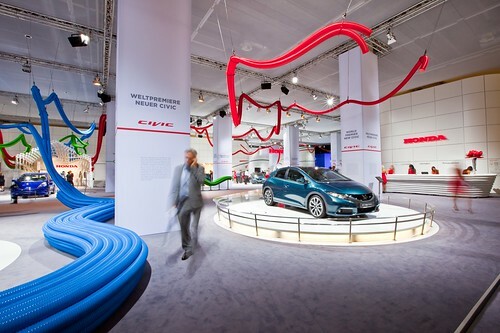 For several months leading up to the Frankfurt 2011 motorshow, I executive produced the Honda stand with an excellent team at Wieden & Kennedy. Creative directing the stand was Tom Seymour and David Bruno. You can see more of their work on their website www.davidandtom.co.uk. 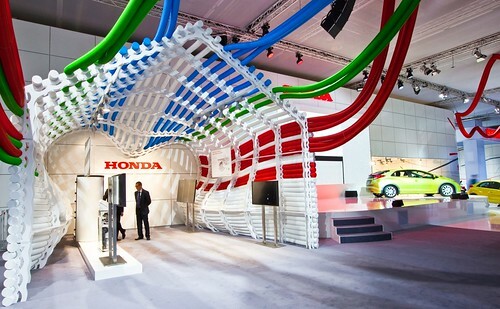 Collaborating with a production company just outside of Frankfurt, Germany, a Belgian artist based in Marseille and Honda clients based across Europe and Japan, we designed, built and implemented a stand for Honda in less than 4 months from start to finish. The design was meant to visual representation of the roads to zero emissions for the motor show, one of Honda’s key cornerstone values. The stand was covered by the full breadth of auto press and design magazines, including Wallpaper (who used one of my images). Here are more images of the stand I took for Wieden + Kennedy’s press releases.